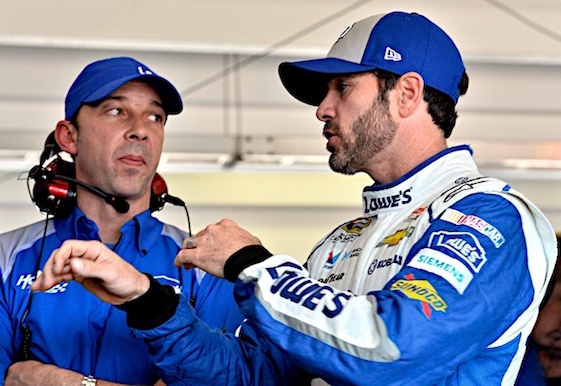 LOUDON, NH – Jimmie Johnson can probably be excused if he is already thinking about next year. It’s not that he isn’t in the thick of the 2017 Monster Energy NASCAR Cup championship battle. The seven-time series champion is seventh in the points heading into Sunday’sISM Connect 300 at New Hampshire Motor Speedway, only the second of 10 races in the stock car playoffs. But it hasn’t been a particularly good season for Johnson and his No. 48 Hendrick Motorsports Chevrolet, the defending series champions and a team used to being a contender at most every race. Johnson goes into this event with three wins this season, but a total of only nine top-10 finishes. And the rest of the elite Hendrick team is in disarray. Fan favorite Dale Earnhardt Jr. is retiring at the end of the season. Kasey Kahne is leaving the team. Chase Elliott, who replaced retired star Jeff Gordon, has yet to win a Cup race. In 2018, Earnhardt’s ride will be taken by Alex Bowman and Kahne will be replaced by William Byron, a pair of young, hungry and unproven drivers. But both remain on the sidelines for the time being. “Both William and Alex are eager to get going and I think both would love to run Cup races this year if they could find the right situation for them,’’ Johnson said Friday. “They’re going to be great assets to the team. We just need to get them laps and get them in the car and start understanding what their vocabulary is and the magnitude on the scales that we all discuss about tight and loose and really build that foundation and get going. Johnson said the team would obviously like to finish strong in 2017 and head into the offseason with some momentum. One of the biggest problems this season has been that the current Chevrolet SS model has not been as fast as the Chevy teams would have wished. Brad Keselowski, who drives a Ford for Penske Racing, said last week that the Toyota teams, led by Denny Hamlin, who won at New Hampshire in July, currently have a speed advantage on the rest of the field. Johnson agrees, but he’s not ready to hand the competition _ Toyota or Ford _ a championship. “I think we would rather just get to work and try to make (the SS) better,’’ Johnson said. “I know that the car that we are bringing out, the Camaro that is coming out next year, is going to be a huge help for us. “When you look at the amount of revisions or iterations that have come out, next year will be the first for the Camaro, first for the Chevy brand, so that is going to be a big help for us. We are doing all that we can and it does seem teams and manufacturers kind of gravitate towards the front. Meanwhile, Johnson’s struggles continued. He crashed in practice on New Hampshire’s one-mile oval on Friday, losing a battle with the sealer applied to the track in an effort to give the cars more grip. He figured it out well enough to get through the first two rounds of knock-out qualifying and wound up earning the 12th starting spot for Sunday’s race with a lap of 131.919 mph..
Kyle Busch led qualifying with a lap of 135.049, followed by Kyle Larson’s 134.911 and Hamlin’s 134.763. (18) Kyle Busch (P), Toyota, 135.049 mph. (42) Kyle Larson (P), Chevrolet, 134.911 mph. (11) Denny Hamlin (P), Toyota, 134.763 mph. (21) Ryan Blaney (P), Ford, 134.720 mph. (78) Martin Truex Jr. (P), Toyota, 134.188 mph. (4) Kevin Harvick (P), Ford, 134.108 mph. (41) Kurt Busch (P), Ford, 133.985 mph. (77) Erik Jones #, Toyota, 133.971 mph. (5) Kasey Kahne (P), Chevrolet, 133.966 mph. (20) Matt Kenseth (P), Toyota, 133.689 mph. (1) Jamie McMurray (P), Chevrolet, 133.680 mph. (48) Jimmie Johnson (P), Chevrolet, 131.989 mph. (2) Brad Keselowski (P), Ford, 133.422 mph. (24) Chase Elliott (P), Chevrolet, 133.357 mph. (88) Dale Earnhardt Jr., Chevrolet, 133.333 mph. (14) Clint Bowyer, Ford, 133.221 mph. (3) Austin Dillon (P), Chevrolet, 133.133 mph. (31) Ryan Newman (P), Chevrolet, 133.007 mph. (27) Paul Menard, Chevrolet, 132.827 mph. (47) AJ Allmendinger, Chevrolet, 132.771 mph. (38) David Ragan, Ford, 132.771 mph. (37) Chris Buescher, Chevrolet, 132.494 mph. (6) Trevor Bayne, Ford, 132.278 mph. (17) Ricky Stenhouse Jr. (P), Ford, 131.628 mph. (19) Daniel Suarez #, Toyota, 132.466 mph. (32) Matt DiBenedetto, Ford, 132.406 mph. (10) Danica Patrick, Ford, 132.383 mph. (34) Landon Cassill, Ford, 132.067 mph. (43) Aric Almirola, Ford, 131.820 mph. (13) Ty Dillon #, Chevrolet, 131.701 mph. (95) Michael McDowell, Chevrolet, 131.683 mph. (72) Cole Whitt, Chevrolet, 130.923 mph. (23) Corey LaJoie #, Toyota, 130.855 mph. (55) Gray Gaulding #, Toyota, 130.184 mph. (15) Reed Sorenson, Chevrolet, 129.918 mph. (83) Brett Moffitt(i), Toyota, 129.710 mph. (33) Jeffrey Earnhardt, Chevrolet, 127.444 mph. (51) Cody Ware, Chevrolet, 124.634 mph. (22) Joey Logano, Ford, 0.000 mph.